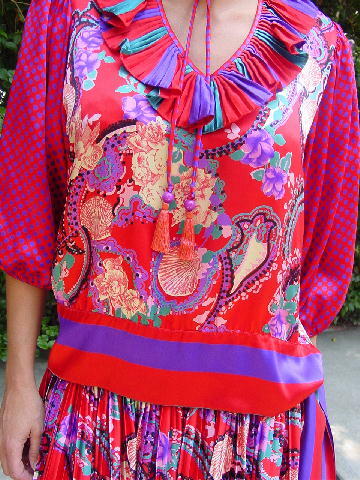 This 100% silk two-piece ouftit is a vintage Diane Freis. The blouse has a 9" deep V neckline with a 3 1/8" wide pleated ruffle. 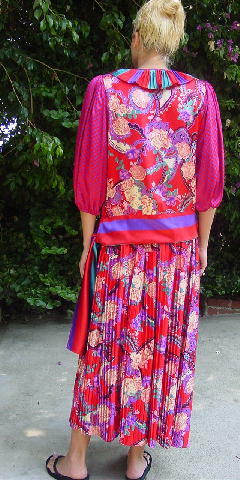 It has fabric matching shoulder pads and peasant sleeves with elastic at the ends - the elastic is loose. 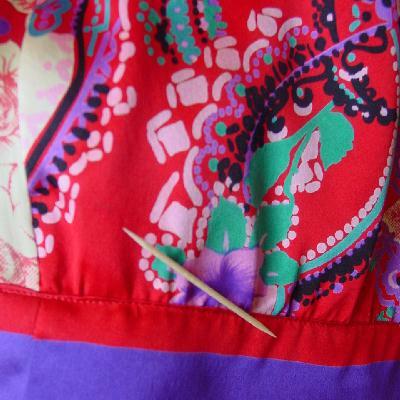 There are two 20" long fabric ties with a light grape wooden bead and an orange tassel below that on each. It has a 4" wide (fabric folded over in the center) bottom panel at the side seam, which turns into two 20" long ties tht flow freely. There is a 2 1/2" long slit at the left side bottom seam. 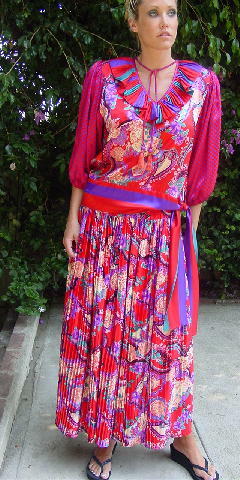 The long skirt has a 2" wide elastic waistband and the skirt is covered in thin pleats. The outfit has a shiny exterior with a red background and a design pattern of shells, polka dots, and flowers and leaves in purple, teal, black, champagne, antique white, and pink. 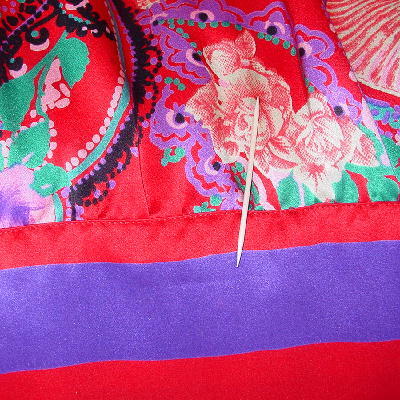 The front has a small spot to the right of the right side seam. It's hard to notice when the blouse is worn. There is a line indentation (possibly an inner side thread pull) in the front on the purple horizontal tie. It's from a former Los Angeles model. shoulder to end of sleeve 18 1/2"
bottom hem side to side above bottom panel) 18 1/2"
waist to hem 34 1/2"